Gunn Family Travels: Goodbye London, Hello Venice! Hey it's big bad daddio, not even yelling at anybody anymore?? Boy that post was news to me too, gee whiz Pauly boy. 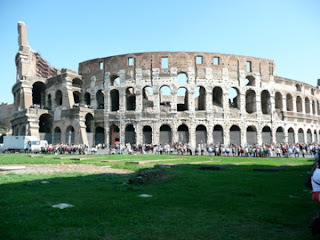 Oh well, today we're in Rome looking out our flat at the ruins of the Colesseum in downtown Rome. We finished up in London with a tour of the British Science Museum (that's the actual Apollo 13 capsule which was pretty neat, but small, holy claustraphobia or what after to the moon and back and 3 stinky guys), saw Princess Dianna's Memorial Fountain and the mandatory trip through Harrods (no we're not buying anything, say it again and again, mantra). We left Heathrow in the pouring rain the next day so timed our 3 days in London just righto. Venice was really cool, even after arriving at our B&B to discover that our email confirmation had been lost in the language translation somehow. Just what we needed after a stressful day of travel, but all was fine after a shuffle or two and we ended up in a dark and dreary, but clean, double roomed flat. Of course the next day involved a trip through St. Marks square and a gondola ride ($150 for 35 minutes) and lots of walking through quaint, narrow passages between buildings. Definately a neat place to visit, but tourist heaven with people everywhere, and extremely expensive so we wre happy to take the high speed Eurostar the next day to Rome.